“I’m being extremely clever up here and there’s no one to stand around looking impressed! What’s the point in having you all?”-The 11th Doctor. 03:08 PM - JessJohnson87 mentioned World of Herps in post Bio-active Leopard Gecko Vivarium. 07:12 PM - JessJohnson87 mentioned Zux in post Roaches? 08:55 PM - JessJohnson87 mentioned Zux in post How hot is too hot? 09:10 AM - CrestedL mentioned JessJohnson87 in post Help rescue 3 geckos? 11:03 AM - Gossamer mentioned JessJohnson87 in post Should I put my Leopard Gecko on a diet? 10:16 PM - Gossamer mentioned JessJohnson87 in post Should I put my Leopard Gecko on a diet? 10:13 PM - Gossamer mentioned JessJohnson87 in post Leopard Geckos laying on thermostat probe??? 07:02 PM - JessJohnson87 mentioned Zux in post Leo suddenly not liking me anymore. 10:05 AM - JessJohnson87 mentioned kholtme in post What size heater? 07:49 PM - Hypancistrus quoted JessJohnson87 in post Pictus! 10:31 PM - Elizabeth Freer quoted JessJohnson87 in post Pictus! 12:06 AM - Elizabeth Freer quoted JessJohnson87 in post Bio-active Leopard Gecko Vivarium. 05:47 AM - Elizabeth Freer quoted JessJohnson87 in post Bio-active Leopard Gecko Vivarium. 12:11 PM - Elizabeth Freer quoted JessJohnson87 in post Bio-active Leopard Gecko Vivarium. 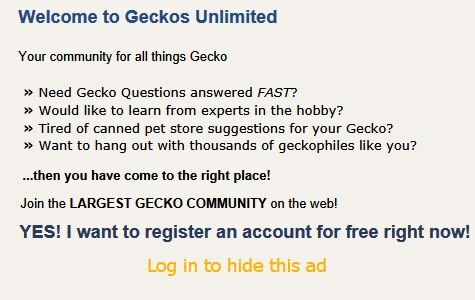 10:26 PM - JessJohnson87 quoted The crazy gecko lady in post Bio-active Leopard Gecko Vivarium. 10:21 PM - JessJohnson87 quoted Zux in post Bio-active Leopard Gecko Vivarium. 10:21 PM - JessJohnson87 quoted Elizabeth Freer in post Bio-active Leopard Gecko Vivarium. 10:30 AM - Spotty the Leopard Gecko quoted JessJohnson87 in post Can I feed Spotty's crickets with these foods-? 01:48 PM - Elizabeth Freer quoted JessJohnson87 in post Hornworm Experiment. 11:35 PM - Elizabeth Freer quoted JessJohnson87 in post Hornworm Experiment. 10:40 AM - Elizabeth Freer quoted JessJohnson87 in post Hunger Strike?